As an aside, or rather a compliment, to the toolbox I've also been intending to create a shave horse to fit into the box. 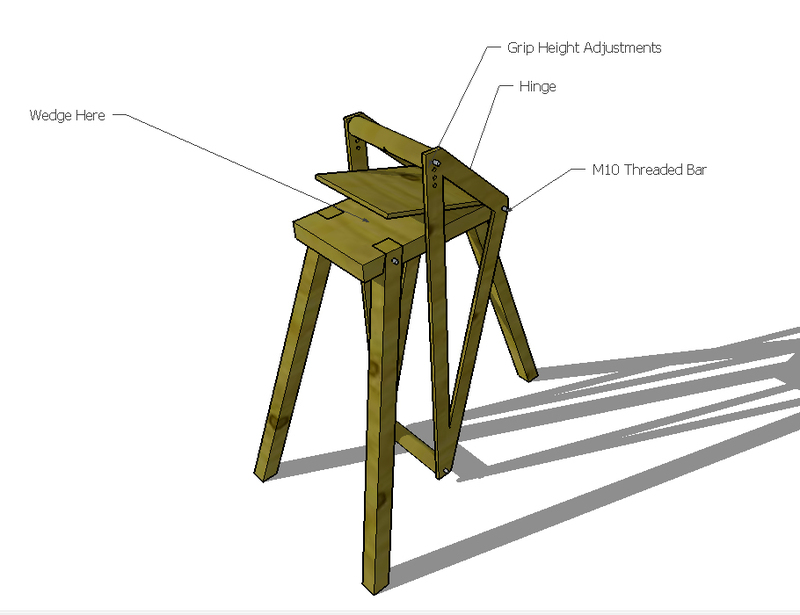 A shave horse (AKA Shave Mule, Draw Bench, Schnitzelbank and Grey Mare, among many other names) is essentially a small stool or bench seat with a simple foot operated friction clamp at one end. It is used to quickly work on objects with a draw-knife or spokeshave. Often it is used to work roughly hewn or split logs into rounder shapes. 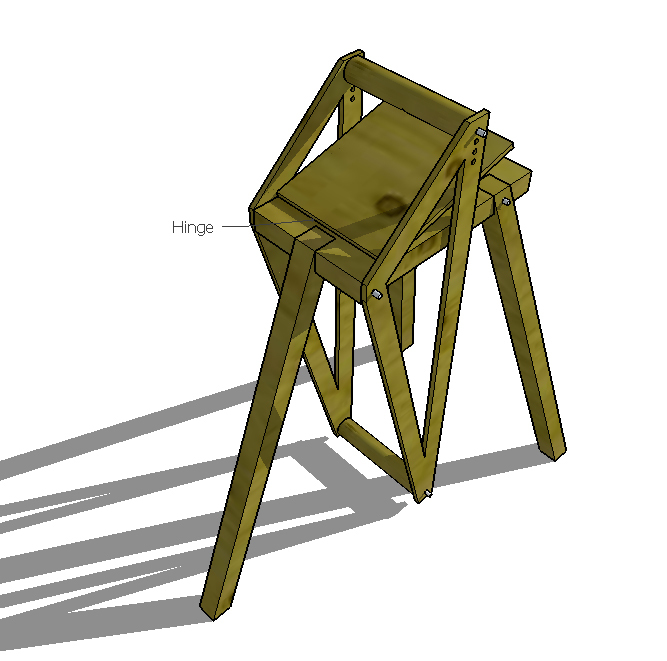 This pinterest page by UK engineer John Hart has a really good collection of reference material for the shave horse which has helped me immensely to conceptualise the forces and movement required for my own shave horse. While generally it is a seated workstation there are alternatives to this such as the table mounted version that is demonstrated and built in this fantastic youtube video by The Renaissance Woodworker, which is operated in a perch stance. 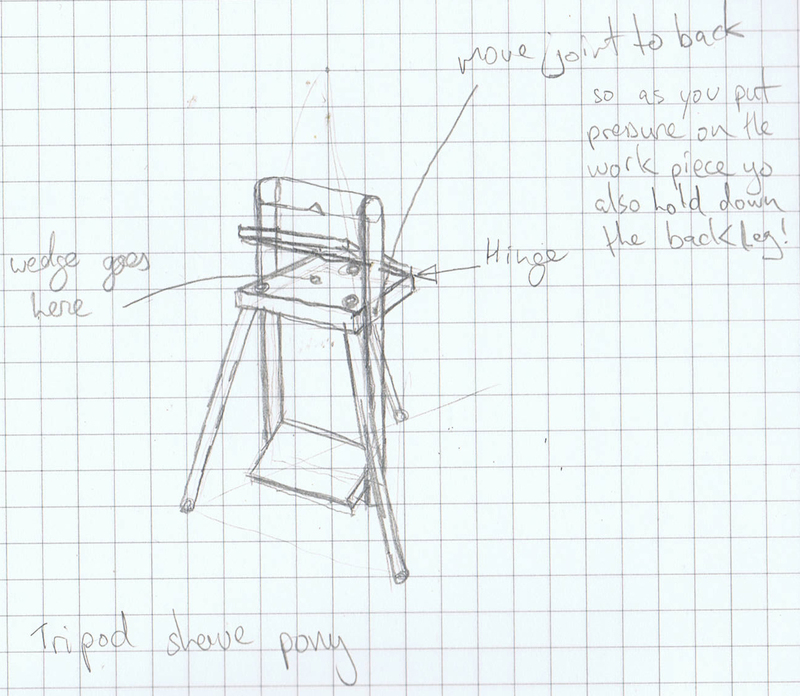 The primary difference in what I'd like to create is an upright free-standing shave-grip-device (animal kingdom pending) and one which can also be disassembled for more compact storage and transport. There are numerous reasons for this but primarily I prefer to work standing up particularly when doing large motions with wood tools as you can literally involve your back and hips in the motion which I think gives you a little extra control over the movement of your blade. The issue of portability and storage should be obvious from the fact that my toolbox/work-station is also portable. There are substantial drawbacks that come with a fully upright version of this tool. Most obvious is the worry of movement while in use. With the seated versions the weight of the user gives the object a mechanical inertia that cannot easily be overcome with the use of the horse. This is less so with a bench mounted version though it can potentially be clamped such that it has even better inertia than the sitting version. An upright and particularly a free-standing version would definitely experience more forces than either of the two other types. I will attempt to address this in a couple of ways. Firstly The stand should have a wide stance. This will hopefully prevent both sideways movement and back and forward movement. The pivot point for the clamp should be as far back on the device as possible. 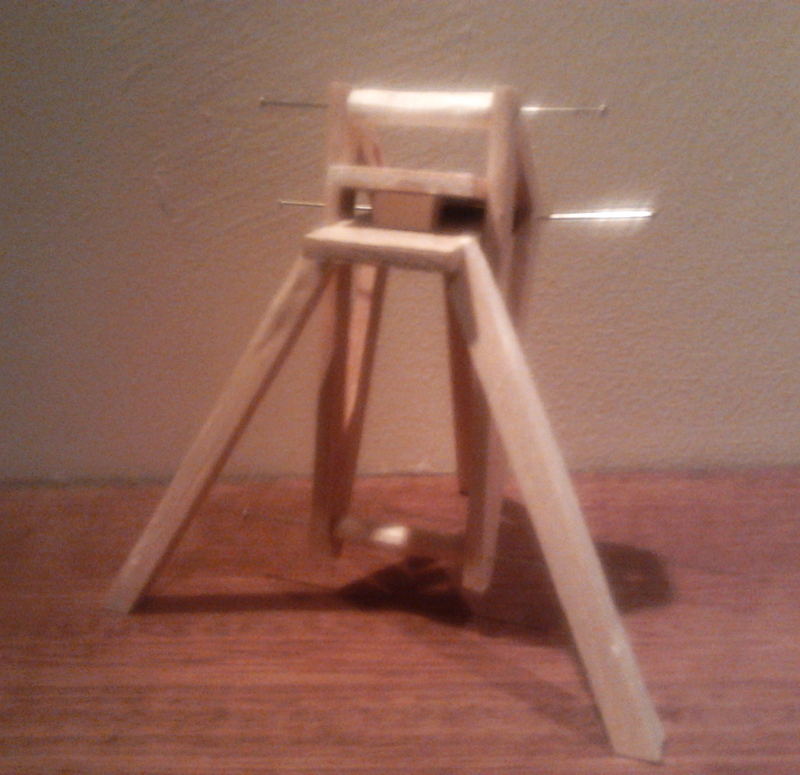 This will be so that clamping an object also transfers your clamping force through the back leg or legs. 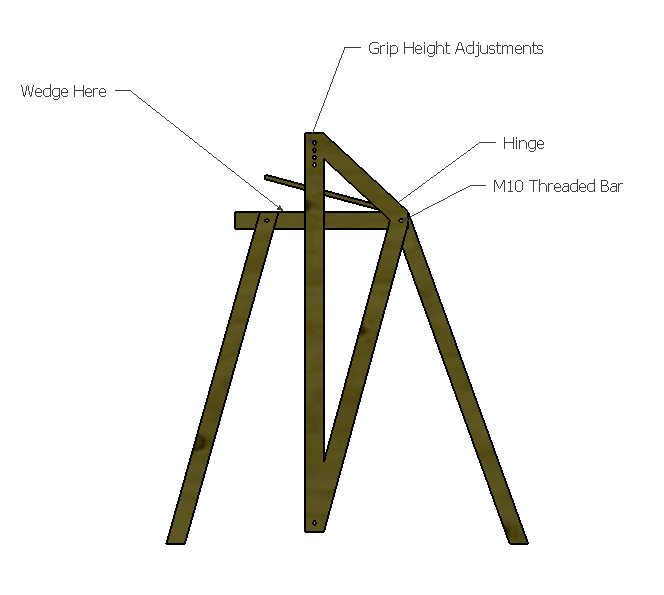 The position of the clamp on the object should also be placed such that any action of a tool on the work-piece will actually contribute to the force on the front leg or legs. 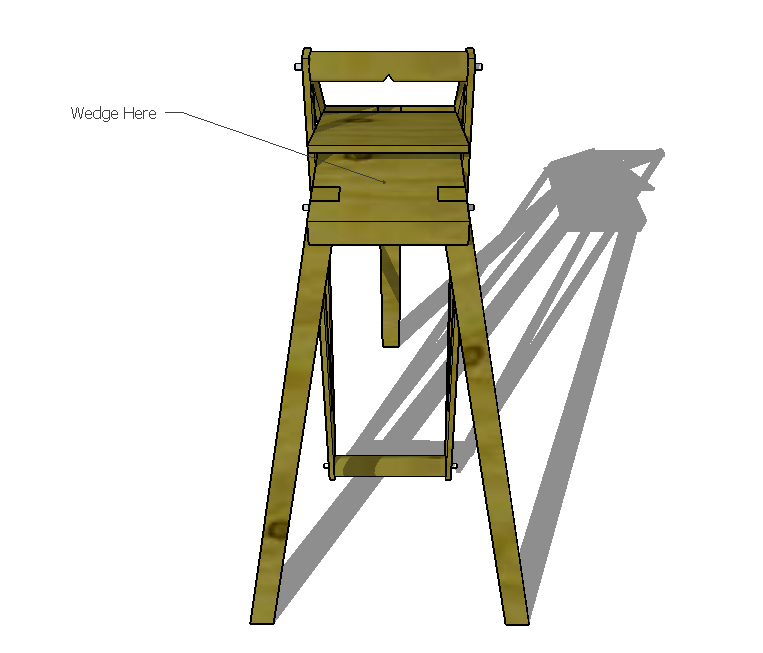 With all that out of the way I'll run through a few of the initial sketches I produced, a quick CAD model I built and finally a balsa wood model with the same movement as the final conceptual object. So first to the sketches. I settled early on a three-legged design being the most logical for reducing rocking on uneven surfaces. This also facilitates the assembly when it includes the rear mounted swing-arm. The first sketch below was very roughly concocted by drawing over the same sketch a few times with different changes so please excuse any overlapping elements. As you may be able to see from this point I'm already trying to balance out the forces by pointing out that the clamp should pivot from further back to give the back leg more stability. Because of the angle of the drawing and the angle of the slanted board, this feature is a little unclear. This board however would be angled by placing a wedge between it and the flat surface, a fairly standard feature of many shave horses. This allows you to adjust the angle of the piece being worked. Finally of note here is the notch in the upper gripping bar. This is so that squared or angular pieces in general can be worked while on edge as well as on their sides. 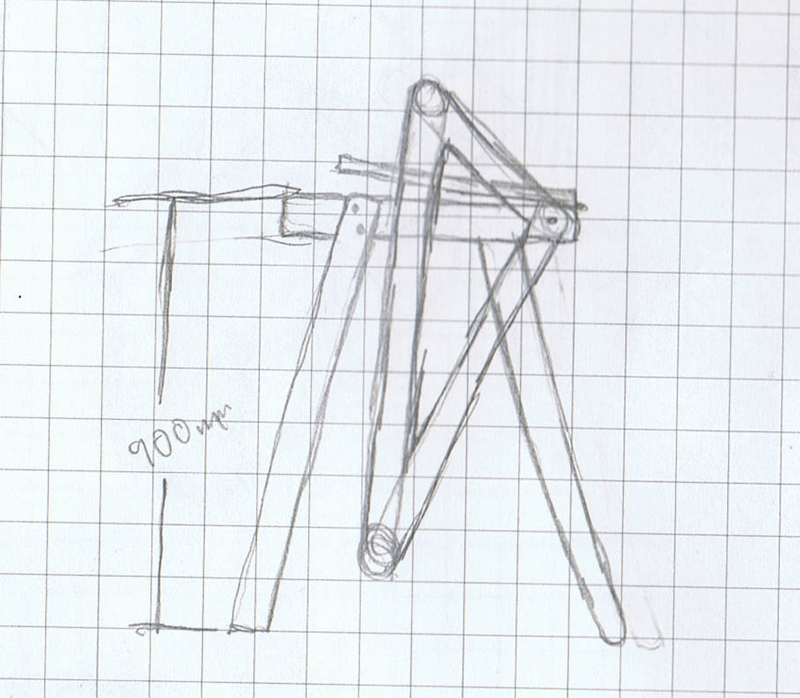 This next sketch shows a side view of the tool and the swing arm. The pivot point of this swing arm being the rear most point of the triangle. I considered adding further smaller triangles inside the large one for extra support but that might have over-complicated this sketch. Here I've also added a rough height dimension for the flat work plane based on a very simple measurement I took from myself holding a draw-knife at a comfortable height. In this sketch I've also replaced the rounded front legs with square bolt on legs for the purpose of easier dis-assembly. From these sketches I moved on to Sketch-up to create a rough representation of the intended design. The first two images below are oblique perspective views of the object from opposite sides of the model. While I'm fairly pleased with the rough arrangement of components there would definitely be more refinement to a final working model of the shave-grip. It became clear from this model that square legs would facilitate the assembly and disassembly of the shave-grip much more efficiently. The final form of the joints for these will probably not be simple straight-through mortice and tenon joints as shown above but should include some sort of shoulder for both alignment and more rigid connection between the pieces. Another thing that I added in this model will be more obvious in the image below, a parallel projection of the side view of the shave-grip. This is a replication of the earlier sketch. The newly added feature is the grip bar height adjustments which is achieved be simply adding more holes to the frame. These would be added where the upper gripping bar attaches to the swing arm. This view also demonstrates well how the adjustment of the wedge could adjust the angle of the piece being worked on. The final image below is a view looking down to the tool from the perspective of the user. What I noticed from this perspective was the importance in the relationship between the legs and the foot bar. That is the legs need to be splayed wide enough so the user can operate the foot bar comfortably. Also the foot bar should not be too far back for it to be inaccessible to the user. 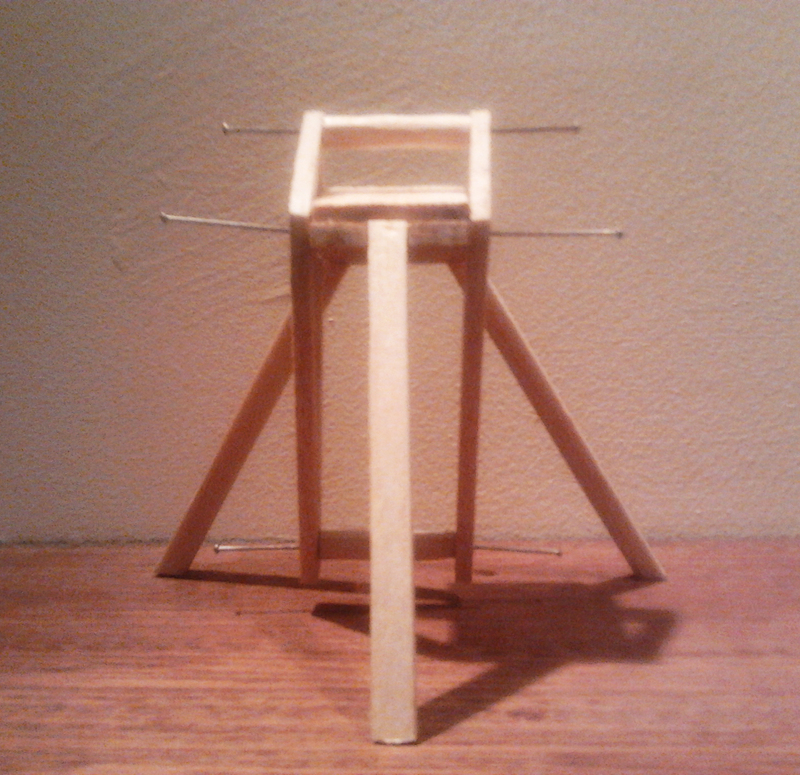 The next step was a simple balsa wood model. I find these can be most useful when dealing with a mechanical object like this where the dynamics or motion are not yet fully understood. 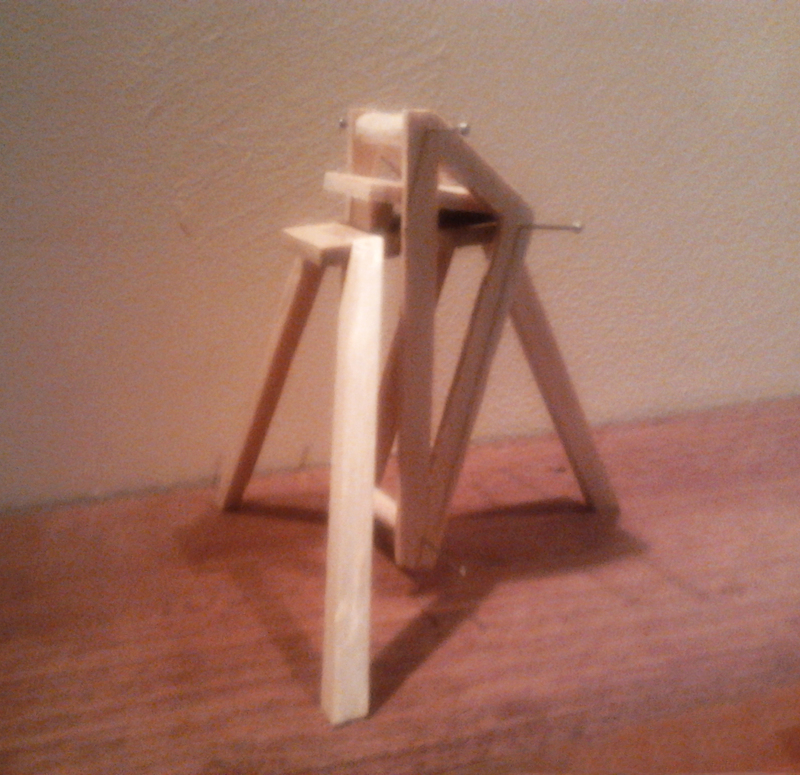 I learned a great deal from this balsa model. As always when building scale models you learn something about the order of construction for the full scale model. For me it was the importance of correctly constructing and calculating the angles involved, particularly in the oddly angled front joints. In the model I also splayed the legs a bit wider to address the leg-space issue; so although the model is scale 1:10 from the dimensions of the Sketchup version it sits a little lower than that version actually would. 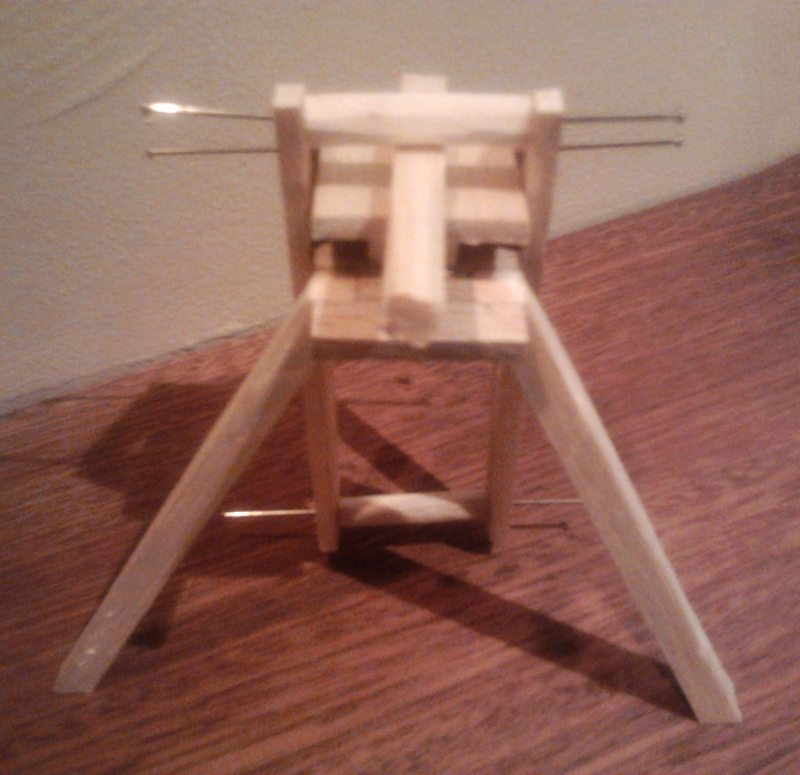 As can be seen in this model it is also held together by sewing pins in the position of the threaded rod and bolts. All thicknesses are roughly correct to scale except for the swing arm which is about 2x scale. This first image recreates approximately the oblique view from the model above. In this however you can see the placement of the wedge and the wider stance of the legs. The view above made me consider the importance of getting the correct angle on the legs for optimal balance and transference of down force while working. 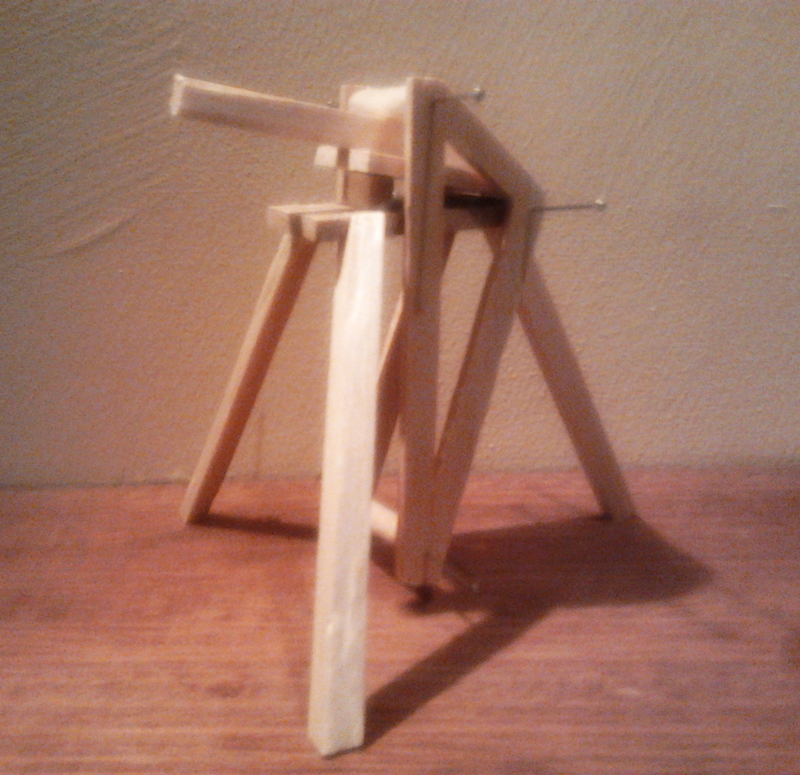 This small model with the extra leg splay already appeared more sturdy than I imagined the Sketchup model might be. This final shot shows the relationship between the front and back legs quite well. The three points as they contact the ground in this model almost form an equilateral triangle. However, the angle between the rear leg and the ground is slightly larger than that of the front legs. One major bit of information I gained from building this model (that I really should have intuited from both the sketches and CAD) is the inherent imbalance of the swing arm. Because of the pivot point being high and towards the back of the shave-grip the arm had a tendency to fall forwards. This could be seen as an annoyance from the point of view of reaching the foot bar but also a positive in so far as it means the shave-grip will have a tendency to mildly grip anything that is put in it. Regardless of the merit or fault of this it could be exploited to good effect or at least addressed in a further test. Next I added a dummy workpiece to the model simply to see how it would look and to see if it could answer any questions regarding function. 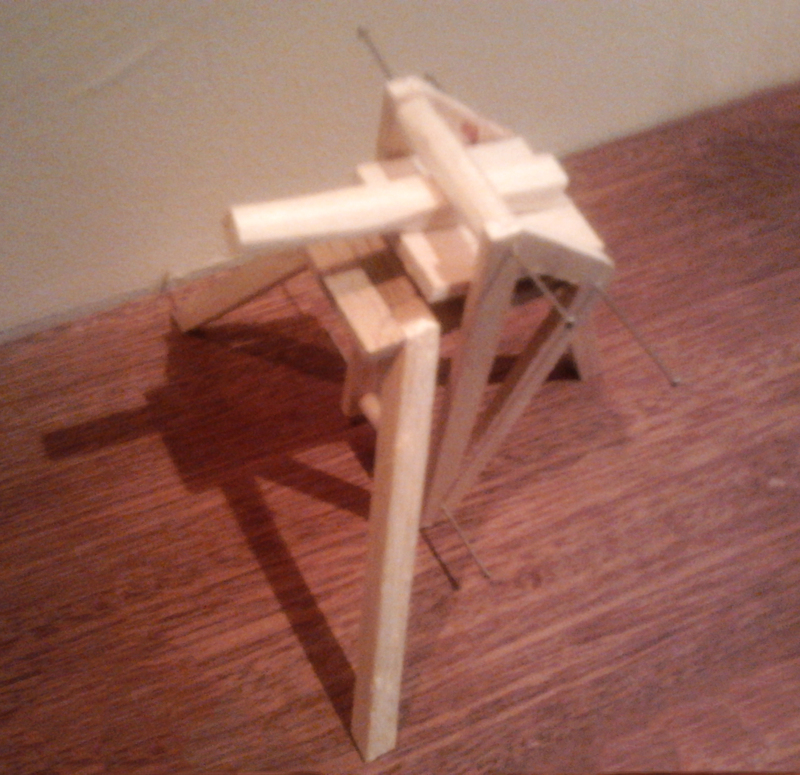 Due to the model being light-weight balsa and being held together with sewing pins I wasn't really able to exert great force on the model though enough force to fulfil some simple tests was possible. I applied some small down force to the foot pedal and the top of the work-piece, both separately and at the same time. This confirmed very well my theory of how the forces distribute. Force acting on the foot pedal was demonstrably transferred the rear leg as was the intention of the swing-arm pivot position. This force caused the shave-grip to move back a little. Force on the work-piece was transferred quite well to the two front legs though this did cause slight forward tipping of the object. With forces applied to both the object remained almost perfectly static as has been the intention of the design since early sketching. This although not anywhere close to a conclusive test was the best test of concept so far. One nice little side note is, because of the bias of the swing arm mentioned earlier, when I attempted to remove the dummy work-piece the shave-grip automatically gripped down on it. This meant I had to loosen the grip action with the foot pedal to remove the dummy. This could very well simply be a feature of the rough soft balsa but it was a nice discovery nonetheless. With all that out of the way the next few posts will probably be more focussed on the toolbox, which I've neglected to update the progress of on here. This has progressed quite far over the last while and I'm finally approaching the building stage. A design for the shave-grip was necessary to inform the internal layout of part of the box, thus why this pops up at this stage of development. A final word on this shave-grip device, or more a question. If the lower seated version is a horse, smaller legged or bench-mounted versions being ponies then what would this lanky legged version be? Perhaps a Shave giraffe? It doesn't really roll off the tongue. Another rather lanky fellow who's all business up top is the rather majestic moose. I must admit I like term shave-moose for this contraption.